This is a stunning villa with its own pool, perfect for families, couples and groups of friends which has been recently been painted inside and out. It is a modern contemporary style for the owners own use and to share with friends and family as well as let when it is available. It is a home from home and has many fantastic reviews and all the things you require from a holiday home. The Villa with its own private pool has designer italian furniture including a comfortable L shape sofa, ghost dining chairs and round glass dining table and luxury beds. Soft furnishings include white bedding from John Lewis, towels from The White Company, furnishings from Habitat and Jasper Conran beach towels. There is a large TV on the living room wall and one on the wall in the master bedroom suite, both with satellite TV. There are plenty of games including monopoly, scrabble, chess, rummikub and others, a wide selection of DVDs including box sets and a Playstation 3 for entertainment as well as an outdoor table tennis table and basketball ring and football for outdoor fun. The kitchen has everything you might need for your relaxing holiday, lots of crockery, glasses and serving dishes. There is an outdoor BBQ. The bedrooms are all doubles with king size beds and have sea views. The master suite has an en-suite shower room, white leather bed and also has a large private balcony with an outdoor bed on it for sunbathing that also splits into a seating area. The price includes air conditioning, wifi, a welcome pack of food and drink and a Villa information pack. All visitors receive a comprehensive villa pack before your holiday including directions and access arrangements, information about the villa and your own guide book on Rhodes. Folks from our maintenance company who look after the villa will visit you when you arrive to ensure you are comfortable and to answer any questions. The villa has three large double bedrooms and is very comfortable for both adults and children. You have your own pool and a large garden and are a 5 minute walk from the nearest beach at Navorone bay which is stunning and has crystal clear waters. The Villa it is a short drive or 15 minute walk to historical Lindos. Beautiful Lindos has the historical Acropolis, white houses,tavernas, lanes and night life. It also has the magnificent St.Pauls bay which is absolutely stunning. Pefkos and Lardos are also a short drive away with their wonderful tavernas. The villa has been totally refurbished the villa to a high standard so that it can really be enjoyed by our guests. We have been holidaying on Rhodes for many years. The villa has 3 large double bedrooms and is very comfortable for both adults and children. There are lots of dvds, games and consoles as well as a table tennis table for outdoor fun. You have your own pool and a large garden and are a 5 minute walk from the stunning beach with crystal clear waters. We love the location of the villa, it is a short drive to historical Lindos and the towns of Pefkos and Lardos with many tavernas and bars. Beautiful Lindos has the historical Acropolis, white houses,tavernas, lanes and night life. It also has the magnificent St.Pauls bay which is absolutely stunning. There are lots of great beaches along the coast and we particularly like taking out a fishing boat at Pefkos for the afternoon or going out on a local glass bottom boat which you can jump off of into the turquoise waters at Navarone bay. We have totally refurbished the villa to a high standard so that it can really be enjoyed by our guests and be our home from home. Downstairs WC. 1st floor family bathroom with bath, shower and his and hers sinks. Master en-suite with private shower room. Very large and comfortable open plan living room and dining area with brand new sofas, dining table, sideboard, coffee table and bookshelf. TV and DVD player. Plus family games, lots of good books, DVDs and CDs and games consoles. Large kitchen with all you might need for your holiday. Fridge/freezer, cooker, microwave and washing machine. Outside: Fantastic large pool 8x4 metres, lit at night. With plenty of beautiful Sun loungers and parasols and outside dining furniture. Large shaded private parking area and large gardens with fruit and olive trees. Utility Room: Ironing board and iron provided. Cot and high chair. Table tennis table. Cleaning / Towels / Linen / Maid service: Regular pool cleaning and garden maintenance. We recently spent a week's holiday at Villa Paradiso which we booked through a recommendation. The villa is in a fabulous location overlooking the sea, situated within a gated community it had a lovely evening breeze across the gardens and pool area. Lindos is ten minutes down the road and Pefkos five minutes the other way. Our expectations were surpassed. The villa is furnished to a very high standard, with a nice open-plan, modern look and excellent amenities. Throughout there are cool, marble tiles and air-conditioning units in every room. The master suite on the top floor has a wonderful private terrace which is perfect for sitting on to watch the sun go down whilst enjoying a glass (or two!) of wine. Everything is in excellent condition and the villa has all the usual cooking facilities, as well as a washing machine and large fridge/freezer. In the lounge area there's a large TV with Sky, a games consul, a huge selection of games, assorted books and a wifi system. The villa felt like a home from home. Outside, there's a nice sized swimming pool with paved barbecue area and gardens. Barbecues became a pleasant evening venture for the perfect end to lovely sunny days. We were not sure how hot it would be at the end of April, but every day reached the mid-seventies and the days were just perfect. The suggested restaurants and 'places to go' books provided in the villa were extremely accurate and helpful. There are the beautiful sandy beaches of Lindos ,and Rhodes Old Town was definitely worth the visit, as are the many fantastic restaurants in Lindos and Pefkos and the Island. A fantastically, relaxing place to spend a holiday - we will definitely be returning! We spent two weeks in September in the villa with our 3 grown up children and had a wonderful time. It's in a peaceful spot between Lindos and Pefkos. We could walk into Lindos in 20 mins but don't know if this would be possible in the height of summer or with small children but taxis and buses do run regularly. The villa is modern and spacious and very well equipped inside and out. 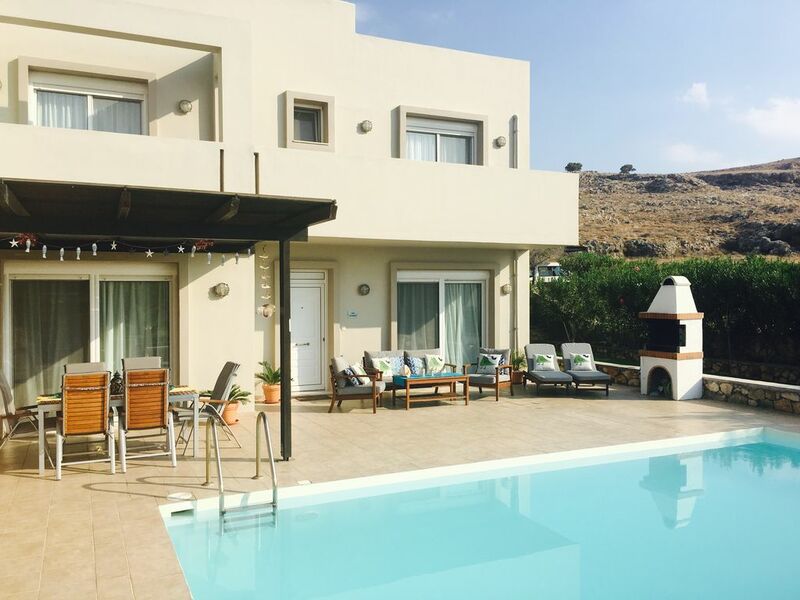 A perfect home away from home which I would recommend to anyone looking for a holiday in Lindos. Stunning Villa - beautiful location!! We had the most amazing week in Villa Paradeiso. The interior is immaculate and fully equipped which gave it a real home-from-home feel. Days were spent relaxing by the pool and enjoying the breathtaking views. In the evenings we enjoyed BBQ and drinks by the beautifully lit pool or went into one of the nearby towns for a meal from the 'recommendations book' with Broccolino being our favourite! The attention to detail made travelling with young children effortless. The vast selection of games and DVDS kept our 3yr old entertained for hours. The convenience of a cot, highchair and plastic plates/cups was perfect for our 11month old. Everything about the holiday was perfect and we left with wonderful memories. Compliments to the owners! Great Villa, Great Location, Great holiday! The villa is beautifully presented - furnished to a high quality, it really felt like a home away from home (far better than any previous Villa we've stayed at). My wife and I stayed in the master suite which was huge and very comfortable. What made it really special was the fabulous private balcony where we would escape and enjoy a glass of wine together at sunset. Both double bedrooms on the middle floor were spacious and comfortable, also with their own balconies. The whole family had lots of fun together by the pool, whether that was splashing around or relaxing on the posh sun loungers. As a bbq lover I really enjoyed firing up the masonry bbq in the evening and dining with the family outdoors. Away from the villa there was so much to do nearby. We loved the beautiful and historic town of Lindos and found the recommendations book very useful enjoying some delicious meals. The Acropolis was breathtaking as were the views and beaches. Our one regret was that we didn't stay for longer...next year. We had the most amazing week at this villa. The property was immaculate and had everything needed for our family. The pool and surrounding area was superb and offered the peaceful and relaxing surroundings we were looking for. Finally, when coupled with the fantastic restaurants of Lindos and Pefkos, this villa really is the perfect get-away. 5 minute walk to nearest beach. Lots of small gorgeous beaches that you can drive to.